An application was made on January 25, 1978 to form the NJ Chapter of the EDP Auditors Association. The area to be served by the chapter was from the northern border of NJ to the area just north of Trenton to interface, but not overlap with the Philadelphia Chapter. The application was made by Richard Hirschfield, John Delaney, Pat Hall, Larry Vernon, Mike Grabowski, and Walt Conway. Companies expected to support the New Jersey Chapter included Merck & Co, Prudential Insurance, Blue Cross of NJ, McGraw Hill, Midlantic Banks, Triangle Industries, First National State Bank, Mutual Benefit Life, Purolator, Selected Risks, and Supermarkets General. ISACA (then called the EDP Auditors Association) approved the request for Charter of the New Jersey chapter on June 8, 1978. The effective date of the chapter formation was July 1, 1978. It cost $160 (6 months dues for 16 members) to start the Chapter. The original bylaws are also part of this record. Unfortunately, records about Chapter activities were not maintained at that time. At the time of formation, there were also 18 transfers from the NYC chapter, 3 members who had been members at large, and 1 transfer from Sidney, Australia. The original Board of Directors included Richard Hirschfield (President), John Delaney (Vice President), E. Patricia Hall (Secretary), Walter Conway (Treasurer), along with Directors Lawrence J. Vernon, Ted Hartanowicz, Mike Grabowsky, and Martin Latman. 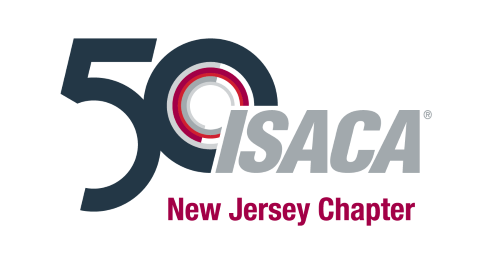 The New Jersey chapter of ISACA is celebrating our 40th anniversary in 2018. By the end of June 2004 the chapter had over 500 members, and by June 2005 there were almost 800 members. In 2016, the chapter introduced certification bootcamp classes available both in person and online.